Lee Herold, DVM, DACVECC, explains how performing an endotracheal wash can save time and the client’s money further down the road with pneumonia patients. Caring for patients in respiratory distress for any reason can be very daunting. As we watch their respiratory rates rise, our own heart rate and blood pressure can continue on this same trend. Beyond the physical exam, the first and most readily available diagnostic tool is chest radiographs. When chest xrays reveal an alveolar infiltrate not related to heart failure then pulmonary sampling is recommended to characterize lesions that could be inflammatory, infectious, or neoplastic in origin. Because it is counter-intuitive to infuse fluid into the lungs of a patient that might already be breathing hard, pulmonary sampling is often an underutilized tool. Whereas transtracheal washes are more invasive and use long through the needle catheters (venocaths) that might not be readily available, the materials needed to perform an endotracheal wash are readily available in most veterinary practices. Properly executed, an endotracheal wash will yield good samples for cytology and sterile samples for culture. An endotracheal wash can be performed in patients of all sizes from puppies and kittens to large dogs. In addition, a carefully executed endotracheal wash will not jeopardize the patient’s respiratory status. Patients with respiratory disease often benefit from oxygen therapy, and during the endotracheal wash we can also provide intermittent positive pressure ventilation to improve oxygenation and we can control the airway preventing aspiration. Step by step instructions for performing an endotracheal wash.
2. Induce anesthesia with IV induction agent to allow intubation. Wear sterile gloves and carefully intubate the patient with the sterile endotracheal tube to avoid oropharyngeal contamination. Secure endotracheal tube and check cuff inflation as usual. Connect patient to oxygen and give a couple breaths until the patient is oxygenating adequately. 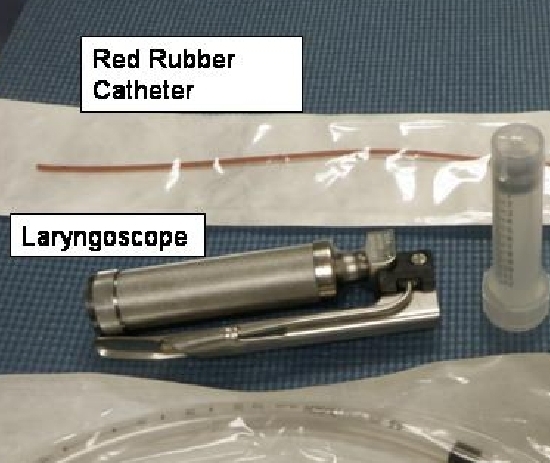 Use red rubber catheter to infuse saline in small aliquots, and aspirate after infusion to collect your sample. The total volume of saline infused should not exceed ~2ml/kg. For example in a 60 pound dog- I might infuse 3 or 4, 12cc aliquots, whereas in an 8 pound puppy, I would infuse 2, 4cc aliquots. NOTE: The volume of sample retrieved is often a much smaller volume than that infused. Have an assistant coupage during infusion to loosen respiratory secretions and improve sample yield. You can also rotate the patient to increase yield in case of unilateral pulmonary lesions. Place wash sample in a culturette, red top and purple top tubes and/or make slides for cytology. 4. After the sample is collected, connect your patient up to the oxygen again, and allow the patient to fully recover prior to extubation. 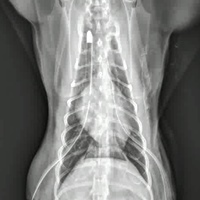 A twelve-year-old male neutered Golden Retriever presented for acute onset of respiratory distress. Radiographs (Figure 2 and 3) revealed left sided alveolar lung pattern. An endotracheal wash was performed and samples submitted for cytology and culture. MICROSCOPIC DESCRIPTION: Smears are variably cellular with good preservation of cell morphology. The most cellular smears contain many neutrophils, low numbers of macrophages, few to moderate numbers of columnar epithelial cells, and small amounts of thin mucus. Infectious agents are not detected. COMMENTS: The cause of the inflammation is not detected. Cocci are not detected. Pending cultures may be helpful, but recent use of antibiotics may affect in vitro growth and may have prevented detection of bacteria in this sample. In this patient the cytology results revealed acute inflammation but no organisms were seen. The culture results however, confirmed growth of Staph pseudointermedius which is considered a methicillin resistant organism. It is also apparent from the culture results that this organism is a highly resistant strain being only susceptible to amikacin, chloramphenicol, tetracycline and vancomycin. By increasing our awareness we can implement greater safety and barrier protocols for our staff and more intensive disinfection techniques. 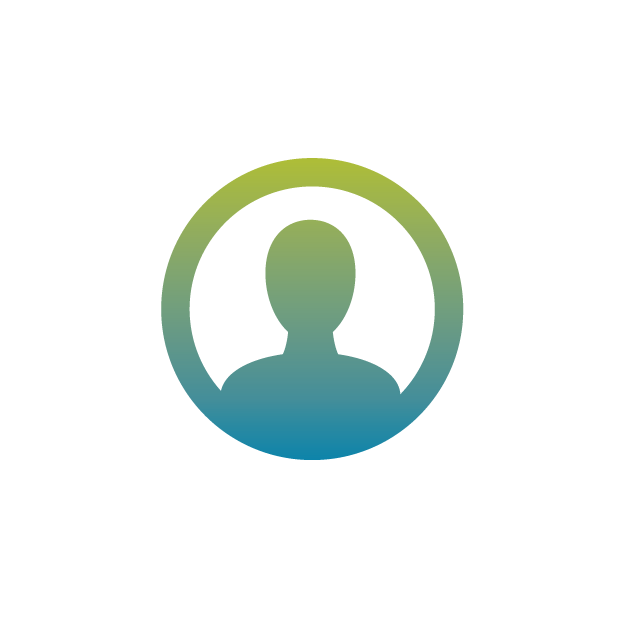 The culture results allowed us to better tailor therapy for this individual patient, protect all of our patients that are hospitalized from exposure to nosocomial infection, as well as protect our staff. Excellent. A video would make it even better. The rads were a bit small for viewing.